You can give these bottles away as gifts or use them around your home to light up a dark corner or use as a night light in the kitchen or bedroom. Lighted wine bottles aren’t that difficult to make if you can learn how to drill a hole through glass without the wine bottle shattering. And if you’re not comfortable with cutting glass, you can simply push the string of lights down into the bottle and leave a length of the cord with the plug hanging out of the top of the bottle. You’ll need to allow enough slack in the cord though, so that when you plug it in, the cord isn’t taut enough to pull the bottle over. Of course, cutting the glass in the back makes for a cleaner look, hides the plug, and you don’t have to worry that the electrical cord will tip over the bottle. 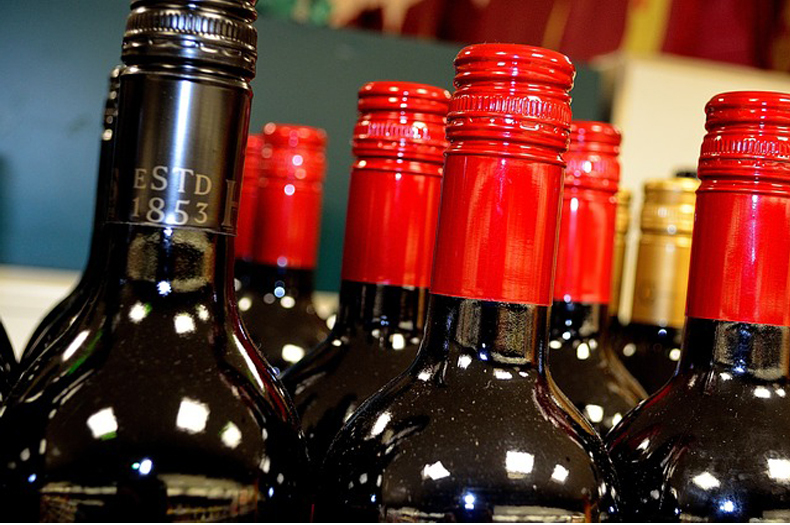 The best types of bottles to use for your lighted wine bottles project are clear bottles. The clear bottles allow the lights to shine through properly, without distorting or dimming the color. 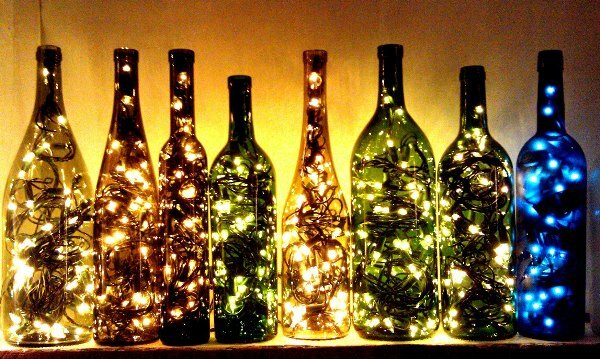 If you do want to use a brown, green or blue wine bottle, it’s best to use plain white lights that will shine better through the colored glass. With any of the bottles, you can leave the original labels on the bottles and simply add the lights. You can also decorate them with some raffia, ribbon or any other decorations to give it a bit more color and personality. I’ve seen some lighted wine bottles decorated with strands of faux grapes and silk foliage, giving the bottle the look of grapes on a vine. You can buy waterproof labels to design and print yourself. Then wrap the wine bottles with the numbered labels. 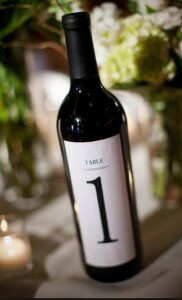 If you’re setting up large tables that seat 8 guests, you can put two numbered wine bottles on each table. Whether you design the labels yourself or hire a printer, you can personalize the labels or add designs to them. Or you can simply have the black number printed on the white label. Or put lights inside of empty wine bottles and tie numbered helium balloons to the necks of the bottles for an even more dramatic effect! You can personalize lighted wine bottles for special occasion gifts like birthdays, anniversaries or showers, just to name a few things. Hit the Dollar Stores and pick up some stickers for the bottles, then add some lights and ribbon. You can also use the bottles as wedding centerpiece decorations and tie helium balloons from the necks of the bottles. And if you use numbered balloons, or write numbers on the balloons before you inflate them, lighted wine bottles can make excellent table number designations for wedding receptions or any party where you’re numbering tables. Lighted wine bottles are a great idea for just about any occasion at all – retirements, graduations, welcome home, weddings, birthdays – almost any occasion, even if the gift recipient isn’t a wine drinker. Do you have lighted bottles that has the cord coming out of the bottom? Hi Frank – all of the wine bottles have cords coming out of the bottom back of the bottle, with a grommet so the cord doesn’t fray.